RICAT stands for Rhode Island Catalog. With the catalog, you can see what books and other materials the library has to offer and you can use the links on the homepage! 2. 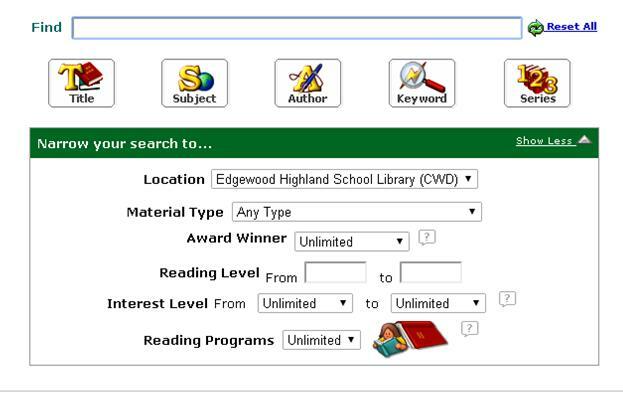 Find and click on "Edgewood Highland"
This is what the search bar for the online catalog looks like. To use the search bar, you have to have an idea of what you're searching for. You can also search for books at other libraries by changing the Location from Edgewood to "RICAT (All Members). Title - Use this button when you know the title of a book you are looking for. Author - Use this button when you know the author you are searching for. It is best to search when you know the author's last name. Subject - Use this button to find items about a certain subject, topic, person, or place. Keyword - Use this button to find items that have something to do with your topic. This is a much broader search and usually has many more results. Series - Use this button to find books that belong in a series. Once you search for an item, the results will look something like the sample below. The arrows show you what everything means. 1. How many books does the library own? 2. What is the call number for this book? 3. What is the book's copyright year? 5. Is this book a just right book for you? How do you know? 6. Where will you find this book on the shelf? Fiction or Non-Fiction? How do you know?